SmartCapture is the professional, easy to use screen capture tool for Windows. The clear and intuitive user interface and powerful features make it the ideal utility for everyone who wants to capture any contents of the Windows desktop. SmartCapture can capture rectangular screen areas, whole objects, windows or screens and it can acquire images from Twain compatible data sources (e.g. SmartCapture 3.13.1 is a shareware program and can be used as a demo to try the software until the free trial period has ended. A full version of the program is available after the trial period ends. 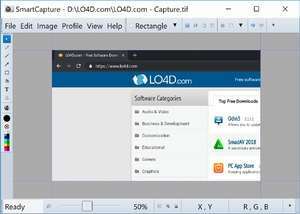 For security reasons, you should also check out the SmartCapture download at LO4D.com which includes virus and malware tests. Additional screenshots of this application download may be available, too. 4.5 out of 5 based on 40 ratings. SmartCapture download been highly rated by our users.